The Tachibana Gallery will hold printmaker Ayaka Asano’s solo show I’ll Tell You My Secrets” from June 8 to 25, 2017. This spring, Asano stayed in Taiwan for one month to hold a solo exhibition. The current exhibition focuses on works which were created based on that experience. In Taiwan, while Asano rented a studio and worked on her art, she also enjoyed chatting with friends in her free time. Among them, the person she spoke with most was Mr. H, who could speak Japanese. She felt a sense of security as the others around her couldn’t understand Japanese, and together they spoke of things such as work and love. 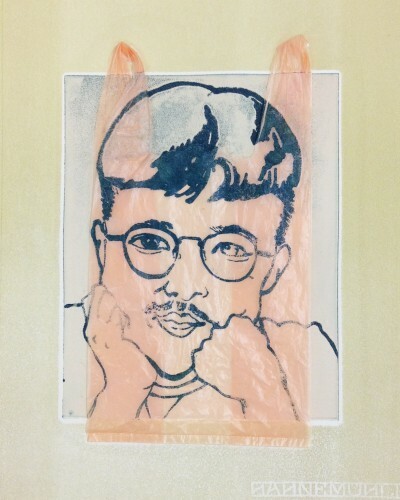 The unassuming faces of her Taiwanese friends, including Mr. H, often appear in her new works. Similar to last year’s solo show, Asano employs collage pasted to the picture surface, using items such as wrappings of foods which she received from close friends in her daily life, as a way of remembering. However, this time the theme of “memories” is different than a way of removing distance. Her prejudice that “what’s far away is the past, what’s in front of you is the present” disappears, and the stance which forsakes memories as things of the past weakens. According to Asano, the unfamiliar land that is Taiwan was overflowing with the “magic of chance meetings.” Experiences were exchanged by talking with people who happened to be present, and Asano tells us of her personal experience of life’s outlook improving. Through each work, one by one, condensing the “magic of chance meetings,” Asano humbly appeals to us the idea that the world can be changed by chance meetings. 2011 – 15: Gemma (Yaizu), Bangaro (Osaka), Gallery H.O.T (Osaka), gallery＆space SIO (Osaka), Venga (Seoul), etc.